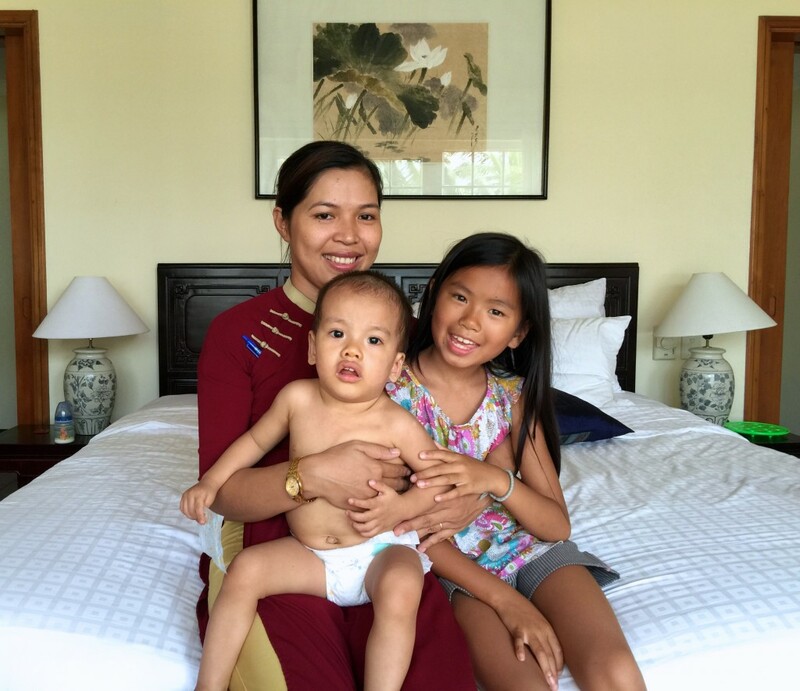 I am so happy that we decided to come here, being in Hoi An has really helped me to connect with Phuc and to get used this new situation in a peaceful way. As I said in a previous post some of the waitresses here recognized and remembered us, there is a girl in particular, named Qua, that we often talked about with Dao, because she had been so nice with us and because we had a photograph of her with Dao and me and I think that Dao cherished this image as a link to her past and origins. It is amazing how mature she seems in processing her past and at the same time opening herself to the future. She was eager to meet Qua, and then she was happy that other 2 women remembered us. She wants to know details of what we did back then, asks if she was looking at the goldfish that swim in the canals that run all along the premises of this beautiful resort, wants Qua to prepare baby food for Phuc as she did for her and at the same time she wants to feed and look after her baby brother in a very loving way. I honestly don’t know what I have done to deserve such a special daughter! Phuc is getting better all the time, more smiles and less crying everyday, very communicative, funny, getting used to us as we are to him, looking for us, playing, filling his eyes with all the beauty that surrounds us. I can’t imagine what goes on in his mind when seeing and feeling all this after being all his life in an institute. He must be in shock! As I got better and felt more relaxed, I managed to bond with him much more and to feel less of a traitor towards Dao, who, as I said before, is the one that guided me into this. The other night, wile we were putting him to bed, something really magic happened. We had come back from Hoi An, this little city is very touristic but stil incredibly beautiful. 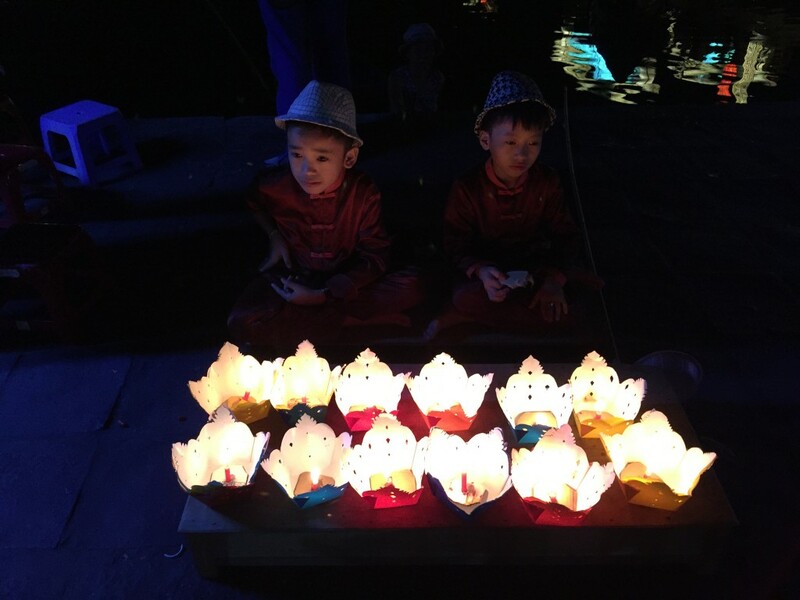 The old city is a UNESCO World Heritage Site whose river banks at night are lighted by thousand colored lantern, while many colored paper lantern, with tea lights inside them, float on the river current. It is very lively, but it maintains a poetic overall feeling. So we came back with our eyes filled with colors and dreamlike images. Phuc had been quite restless in the restaurant and we had to take turns in eating while the other one was running around the place with him, to keep him occupied. He also got quite restless in the taxi home, not being used to be in a car and especially to be constrained by someone’s arms, but then, as we were in our room facing the sea, he seemed quite happy to enter his bed, although not ready to sleep and still a little agitated. So, after changing him, giving him his bottle of milk and playing his music toy I started stroking his tiny feet, but he was still rolling around in bed quite vigorously. Than Dao came next to me and started caressing his head and as he gradually calmed down, I started stroking Dao’s back and we went on like this, in this chain of quiet and mindful giving until he fell very peacefully asleep.